Superficially the data shows the impact the bikes are having on leisure time. The lifestyle advertising seems to have made headway as touristy areas thronged with cyclists. 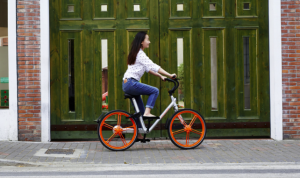 By revealing the data behind the trend, Mofang demonstrates how applying AI to massive amounts of data is going to create a valuable resource for Mobike as it builds a more detailed picture of its users’ lives. Selling targeted data to travel companies (or setting up your own) is one thing, but the fact the company is showing that when you head out for a holiday cycle, it knows who you’re cycling with and when, where, at what speed, and whether you’ve traveled together from somewhere else. All this hints at just what else that Magic Cube might glean from its database.